I made three of these cards which are 5" x 7" using dies, stamps and stencils etc from your collection, Christina and by following techniques on your videos. 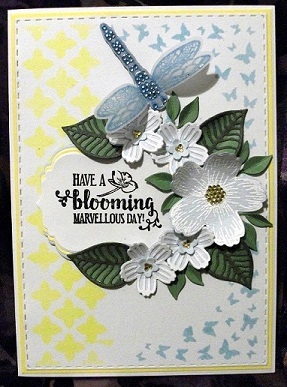 Also, on the blue and lemon card I put a dragon fly on, which I made using my free die and stamp from my magazine. The fourth one is 6" square and is matted and layered with pink and green card and the white layer is embossed with an Apple Blossom embossing folder from the collection which includes 'that' folder which came free with Papercraft Essentials. The sentiment across the middle was a stamp which was free with Simply Cards and Papercraft (which I subscribe to). I used distress inks and sponges to colour the embossing. 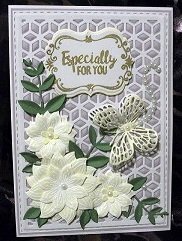 I used the flower die from the complete card and box die set to make what I hope looks like what I call a spider chrysanth. I absolutely adore these flowers in green. I also used the leaf spray from this set. I used the dies from the Apple Blossom set that corresponds to these embossing folders to cut the wave across the middle and the butterfly die to make the butterfly. I then cut the flourish in the same colour and trimmed off one end and used this to represent the butterfly trail. I then sparkled it using glue and chameleon glitter. I was quite pleased with the finished results and I hope you like them. What a beautiful collection of cards and it gives me so much pleasure to see how my collection is being put to use. 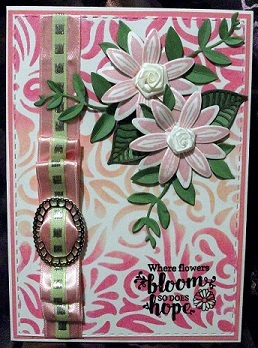 I thought you might like to see what I came up with using your card and box die set and the quatrefoil die. I must say, Christina I love using these dies - they make good clean cuts and also cut first pass through the die cutting machine. Both cards are 5 x 7 - one in portrait and one made as a stepper card. I watched both your videos and adapted the designs for myself. The white one is using ribbon threading and I did this all over the trellis. I used the flower dies from the set to make one gerbera type flower and the other one to make two other flowers. I also cut some leaves and then stamped and embossed a sentiment on the plaque. I then arranged these on the card to complement one another. The blue card I made following the technique on your stepper card to emboss the coloured layer to protrude through the trellis and then cut to size to fit on the front of the card and on the 'step'. 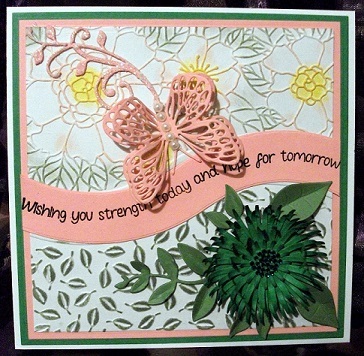 I then used the gerbera type flower and leaves arranged to the left of the card. I cut three butterflies in blue glitter card and backed them with parchment to - I think - give them an ethereal look. 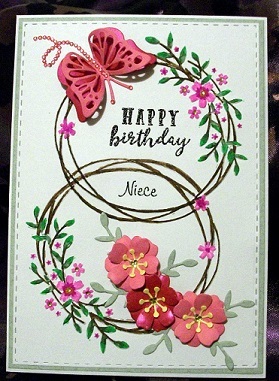 I arranged the flower and butterflies on the front of the card and the 'happy birthday' sentiment on the 'step' behind. I hope you think I have done them justice using your die sets. 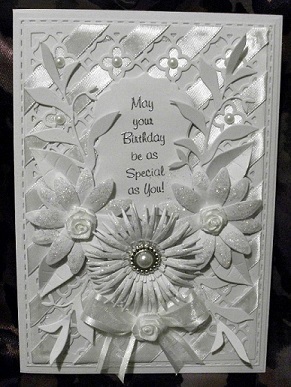 This card is made using the dies in your new card and box die set, Christina. I have also used the quatrefoil trellis die. The card base is made using the card base die and then the stitched die for the next layer. I wanted to make a white on white card so everything is cut in white including the trellis die. I used your idea for ribbon weaving and did this across the whole of the trellis panel. I then made the flowers and I absolutely love the 'daisy' die as it makes for a very pretty delicate flower. I've recently received the latest edition of the magazine I subscribe to and must say I am very pleased with it and the free gift that came with it. I watched your ideas video for the mag, Christina. The first one I made for my niece's upcoming birthday. It is a 5 x 7" card with a green mat and then on the white layer I used the embossing folder at the top and then turned the card round and embossed at the bottom taking care not to overlap too much so that it didn't 'squash' the embossing too much. I then coloured the embossed part to highlight the pattern. 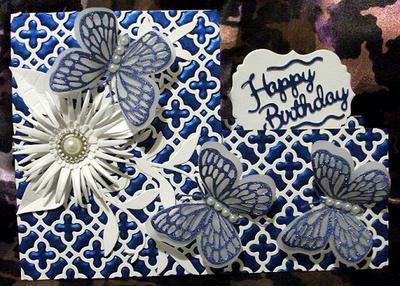 I made flowers and a butterfly with the free die and arranged them on the card to accentuate the design. I then stamped and heat embossed the sentiment in the spaces. The other card is 6"square and has a kraft card mat and the wall backing paper is embossed. I then fussy cut out the middle and coloured the embossing also. I then stamped and heat embossed the sentiment down the right hand side and attached some twine tied in a knot across the bottom. I used a piece of white card to go under the aperture which I coloured with distress inks to represent the sky and grass. I glued this onto the mat in the relevant position and then attached the wall paper onto the front using foam tape. 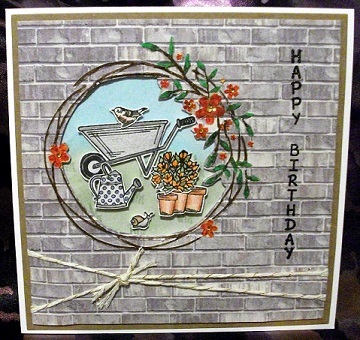 I stamped and coloured in a wheelbarrow, plant pots, flowers, watering can, bird and a snail. I arranged them in the aperture to represent a scene. I think the final card would be suitable for a man who is a keen gardener. Both of these cards are so lovely and I am sure your recipients were delighted with them. Magazine Freebies are such a good way to increase the stash that we crafters love to collect. The quality is excellent and the choice with some mags is perfect from Dies, stamps, stencil and embossing folders.